The first difference between running on a treadmill and running outdoors is wind resistance. When you run on a treadmill you are running in place. You are not moving through the wind as you would outside, which gives your body resistance. Studies have estimated that the air resistance can increase your workload by up to 10% depending on your running speed. As a result, you should run with a starting incline of 1 on a treadmill to compensate for the wind resistance that you may find outdoors. 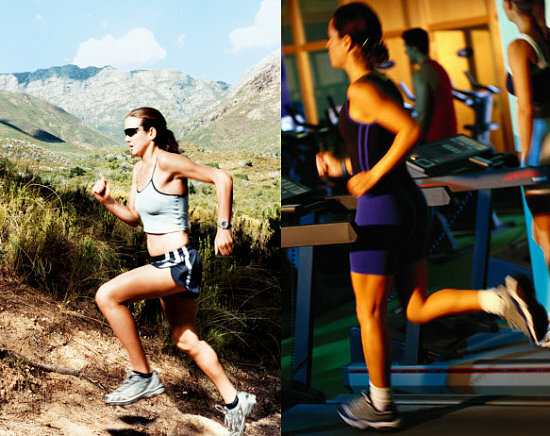 Another difference between treadmills and outdoor running is the running surface and your running form. When running outdoors you are constantly changing terrain as compared to a treadmill when you may only run at one level. A negative result of running on a treadmill is the lack of proprioceptive training, which is feeling and knowing the position of your entire body when in running stride. It is harder to do this on treadmills because the moving belt is a constant motion that isn’t rough and uneven like the outdoors. The moving belt is essentially doing the running for you and forces your body to run. To overcome this on a treadmill, try to keep a balanced and well-adjusted running stride. Running outdoors is certainly your best bet although a treadmill can be an effective alternative.